The bayberry is a small shrub native to North America and found in sandy areas along the Atlantic coast from Maryland northward. It is sometimes called candleberry and wax myrtle. Bayberry candles are made from the waxy fruit of the shrub. These candles are dripless and their flame is brighter than any other. 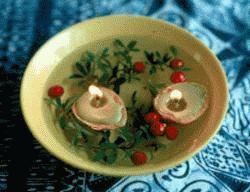 Bayberry candles can be made in commercial candle molds or you can make little floating candles in walnut shells. These little walnut boats can be placed in a bowl of water and will glow for over an hour. Pick out as many leaves, twigs and other debris as possible and pour the berries into the pot. Fill the pot with water so it covers the berries by an inch or two. Bring the water to a boil and let it bubble for five or six minutes. Then, let this cool slowly at room temperature or leave to cool overnight. The wax will separate from the berries and float to the top. When the wax is cool, lift it off the top of the water and break into pieces that will fit into the coffee can. Throw away the remains in the pot. The wax may still hold dirt and debris which must be sifted out before making the candles. Place the coffee can filled with wax in a pan of water and heat on the stove at a low temperature. As the chunks of wax melt down in the can you can continue to add more chunks. When the wax is melted it will have all the debris floating in it. Place a piece of paper towel over the top of another empty coffee can so the toweling is slightly depressed into the can. Leave enough towel hanging over the edge so you can hold it against the outside of the can while pouring the hot wax through the filter. Pour the wax a little at a time through the paper towel. Since the wax is cooling and solidifying as you do this, reheat the wax in the poruing can every so often. The hotter the wax, the quicker it will sift through the towel. To open the walnuts: Place a walnut on a chopping block and, using a sharp knife, place the blade into the opening at the point of the walnut. Hold the nut with one hand, keeping your fingers high on either side. Bare down with the other hand on the knife handle. Remove the meat from the inside of the shell. Open approximately 12 walnuts. Fill a baking pan with sand and place the shells on the sand. Dip a long wick into the hot wax and stretch it out to dry. This takes minutes. Cut the wick into 1-1/4 inch pieces. and dip this bent end into slightly cooled wax. The cool wax will be the consistency of gelatin and acts as the glue to hold the wick in the nutshell. Place the waxed part of the wick so that it lays in the center of the bottom of the shell and press it down to hold in place. This will dry almost immediately and the other wick end will be standing straight out of the shell. Reheat the wax in the coffee can. Pour a little bit of wax from the stove into a smaller can for filling the nutshells. Fill the walnuts half way to avoid air bubbles. Let this cool and then fill each to the top. The color of the candles will be green. Fill a pretty bowl with water and float flower buds, berries or leaves with the berry candles in nutshells.